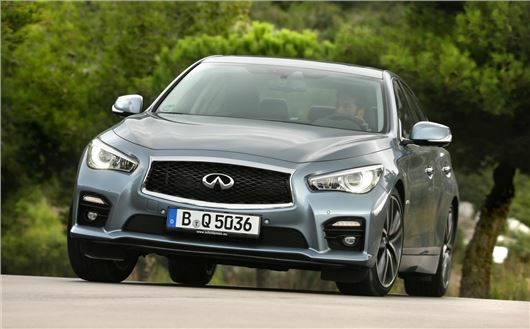 The Infiniti Q50 range is to be boosted by the addition of a new, smaller 2.0-litre petrol engine. It’s on sale in China from early 2014 but its availability in the UK market is to be confirmed. A spokesperson from Infiniti said “We are hopeful that it will be coming to the UK but no final decision has been made”. The new engine is a four-cylinder turbocharger petrol with a peak power output of 214PS. Much like a diesel engine it produces peak torque low down in the rev range, with 320Nm available from 1250rpm. On paper that makes the 2.0-litre engine look flexible and versatile without needing large displacement. The 2.0-litre petrol joins a 170PS 2.2-litre diesel, a 306PS 3.5-litre petrol hybrid and a 333PS 3.7-litre V6 petrol. It’ll initially be available in China from Spring 2014 and it is confirmed for European market Q50s, but the final decision on whether the engine will be offered to UK buyers has yet to be made.